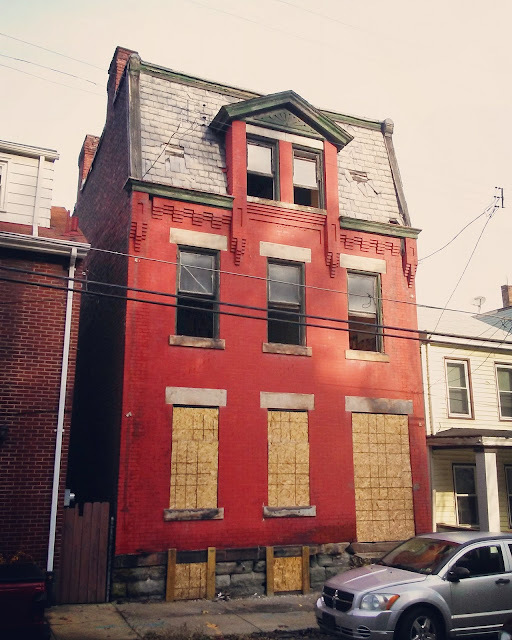 Long-vacant and endangered, this house at 1214 Voskamp Street in Pittsburgh's Spring Garden neighborhood still stands, but awaits an uncertain future. This house was the site of a grisly murder-suicide in the 1950s. It was added to the Pittsburgh demolition list last year, but curiously survived...for now. You would think that some of the Larryville prosperity would leak over into Troy Hill and Spring Garden. Especially with Penn Brewing and Wigle Whiskey not far away. You would think that Voskamp would have been gentrified with the newer construction along there, but apparently that did not happen.